When it comes to fertilizer storage, adhering to safety regulations is critical. For maximum safety, your fertilizer storage building should maintain dry conditions and segregate fertilizers from other chemicals such as pesticides. It is crucial for your fertilizer storage building to include a secondary containment sump in case of spills or leaks. Total compliance and safe storage can alleviate the risks associated with fertilizer storage, including events that may affect the community and environment. Fertilizers should be stored in dedicated storage units in order to meet all requirements and maintain a safe environment within your facility. Fertilizers should be stored in a cool, dry area. A containment sump should contain spills or leaks to prevent materials from entering the environment. 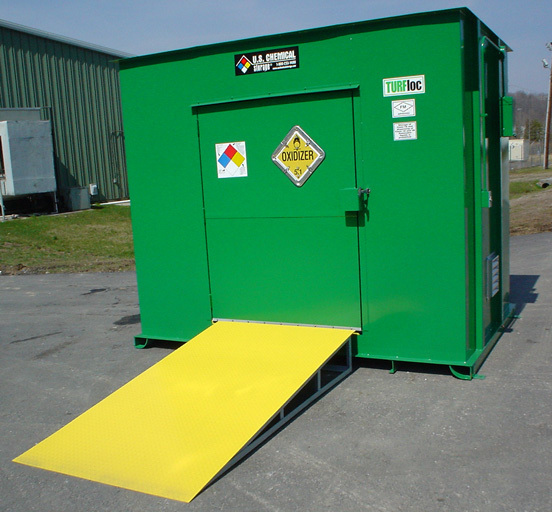 Storage building should be locked and all doors clearly labeled to prevent access by personnel or visitors, who might be subjected to or cause hazardous conditions. Pallet racks or shelves can prevent fertilizer storage from interacting with the floor, which may contain other hazardous materials if not properly segregated. Efficient storage conditions can alleviate the risks involved with fertilizer storage, allowing for quick and convenient storage and removal. Access ramps and road access can help with these procedures. Fertilizer storage units should be furnished with a fire detection and alarm system, as well as mechanical ventilation. For large quantities of fertilizer storage, inventory should be recorded and dated. This process can help keep track of outdated materials, as well as the amount of hazardous materials on hand. This information can aid emergency responders in the event of a fire. U.S. Chemical Storage has fertilizer storage buildings to meet your needs, whether in large quantities or small amounts. Our buildings are compliant and customizable, ensuring you the highest safety standards in your fertilizer storage, including racks, temperature control, mechanical ventilation, spill detection, and explosion proof accessories to provide efficient storage and maximum protection. Our fertilizer storage buildings are constructed of noncombustible materials, designed to withstand the harshest weather conditions. We understand the importance of maintaining your fertilizer for safety and compliance, and with our fertilizer storage buildings, we aim to do just that.